Discovered 1780 by Pierre Méchain. Messier 74 (M74, NGC 628) is one of the nicest examples of so-called "grand-design" spiral galaxies seen face-on, so that its spiral structure stands out conspicuously. With its comparatively low surface brightness, it is one of the more difficult objects in Messier's catalog, situated in constellation Pisces. Pierre Méchain found M74 at the end of September 1780. He reported his discovery to his friend, Charles Messier, who determined its position and included it in his catalog on October 18, 1780. It is among the first "Spiral Nebulae" recognized; Lord Rosse lists it as one of 14 "spiral or curvilinear nebulae" discovered before 1850. This conspicuous spiral is a prototype of a grand-design Sc galaxy. It is classified in more detail in De Vaucouleur's scheme as of type SA(s)c, i.e. a barless (therefore "SA") Sc spiral without a ring structure ("s"). Its distance may be about 30 to 40 million light years (R. Brent Tully's Nearby Galaxies Catalog has 32), as it recedes with 793 km/sec. Then its spiral arms are about 1000 light years broad. They are traced with clusters of blue young stars and pinkish colored diffuse gaseous nebulae (H II regions) in color photos, and reach out to cover a region of more than 10 minutes of arc in diameter, corresponding to roughly 95,000 light years, or about the same size as our Milky Way galaxy. The Webb Society Deep-Sky Observer's Handbook gives a number of 193 known H II regions. The nucleus of Sc spiral galaxy M74 is small and bright. The large number of H II regions and the pronounced spiral pattern indicate that star formation currently occurs vividly in M74's disk. These regions show up as bright knots in the UV part of the spectrum also; see the images from the UIT telescope, ASTRO-1 Shuttle mission. The remarkably symmetric appearance over the whole galaxy is probably caused by the global phenomenon of density waves sweeping around M74's gaseous disk, probably induced by gravitaional interaction with neighboring galaxies. When gas clouds orbiting within the disk encounter such density waves, they are accelerated into the spiral shaped wave crest, and then slowed down, so that they converge toward the spiral arm, enhance the density wave. Moreover, collisions and mergers of neighboring clouds occur, which are thought to induce the observed starbirth activity along the spiral arms. 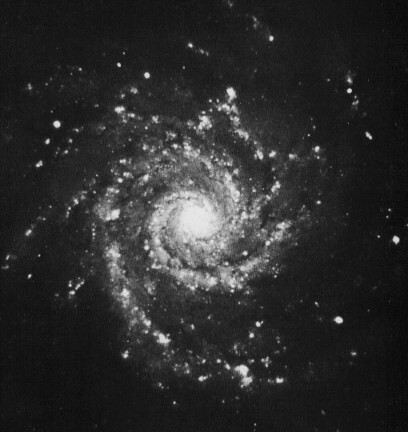 M74 is probably the chief member of a very small physical group of galaxies, which includes the peculiar SBa barred spiral NGC 660, the peculiar Sm galaxy UGC 891 (of a mixed type between spirals and irregulars), and the irregulars UGC 1176, UGC 1195, and UGCA 20. For the amateur, very good conditions are needed to see more than this nucleus. But if they are given, suggestions of the magnificient spiral arms become apparent in telescopes starting at 4-inch. In telescopes of this size, the nucleus appears quite sharply limited, the diffuse hazy and mottled disk around it can be traced to a diameter of about 6' to 8'. Numerous faint foreground stars are visible in the field around this galaxy. Larger telescopes show the faint spiral arms more and more clearly, and in large amateur instruments (16-inch up), knots become recognizable within and between the spiral arms, which are foreground stars as well as star clouds and nebulae within M74's disk. Supernova 2002ap was discovered in M74 on January 29, 2002 by Japanese amateur Yoji Hirose when it was at mag 13.7. This type Ib/c supernova brightened up to mag 12.3 between February 5 and 12, 2002, and was classified as a "hypernova," occurring when progenitor stars of at least 40 solar masses explode. Supernova 2003gd was found visually in M74 by Bob Evans on June 12.82 UT, in the morning twilight at Australia as it was 13.2 mag bright, and already fading. This supernova was of type II. M74 can be found easiest from Hamal (Alpha Arietis); from this star, follow a line via Beta Arietis to Eta Piscium (mag 3.5); M74 is about 1/2 deg N and 1 1/2 deg E of Eta Psc; this route is also particularly well suited in Messier Marathons. It may be difficult to find M74 under the slightest light polution or other imperfect viewing conditions, as its nucleus is almost stellar, and the disk and spiral arms of considerable low surface brightness. It may help to locate the pair of 6th-mag stars, 103 and 105 Piscium, about 1 deg NE of M74, and look up a pair of 10th mag stars, about 3' apart and oriented N--S; M74 is about 6' West of this pair. The nearby star Eta Piscium is a double: A, 3.7 mag; B, 11.0 mag; position angle (PA) 19deg, separation 1.0". Messier marathoners often miss this galaxy in the evening, as it stands near the border of the "Messier-Free Zone" in the sky. Only globular cluster M30 is missed more frequently than this galaxy. The almost stellar nucleus has been erroneously cataloged as a star in the "Bonner Durchmusterung" by F.W. Argelander in 1860, under the designation BD +15deg 238. Kenneth Glyn Jones (ed. ), 1981. Webb Society Deep-Sky Observer's Handbook, Vol. 4: Galaxies. Enslow Publishers, Hillside, NJ [ADS: 1981wsds.book.....J]. Here p. 458.